Keeps your makeup all fresh and in place for 12 hours! Comes in 5 different shades to suit the varying tones of indian complexion. Comes with SPF 34 PA+++ that protects your skin against the harsh effects of sun. Its special mineral formula absorbs excess sebum and keeps you fresh for hours. The magique kajal nourishes your eyes, and its smudge proof and waterproof formula lasts upto 12 hours. Be "touch up" free every time you top your makeup up with L'Oreal Paris Mat Magique All-In-One Pressed Powder, and sport rich and dark kohled eyes, all day long. Stay fresh for hours and face the sun with confidence. Explore the entire range of Compact available on Nykaa. 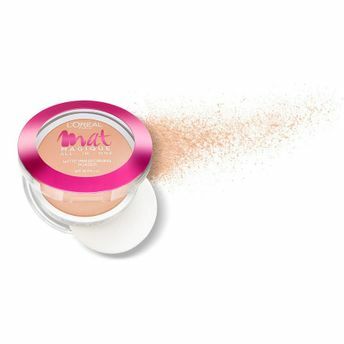 Shop more L'Oreal Paris products here.You can browse through the complete world of L'Oreal Paris Compact .Alternatively, you can also find many more products from the L'Oreal Paris Mat Magique All-In-One Matte Transforming Powder range.